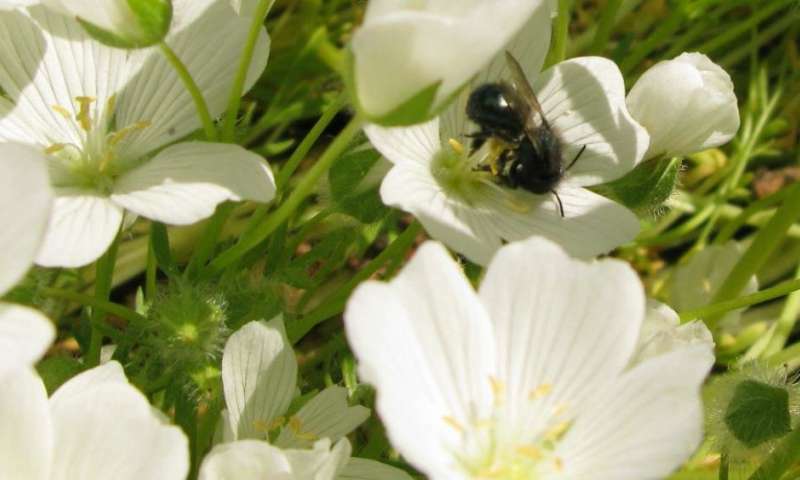 Meadowfoam, a native Pacific Northwest plant cultivated as an oilseed crop, has emerged as a potential new source of protection against the sun's harmful effects on the skin. The findings by scientists at Oregon State University are important because nearly 10,000 people a day in the United States are diagnosed with skin cancer, resulting in large part from the DNA damage caused by the ultraviolet radiation the sun emits. In addition to cancer, prolonged exposure to the sun can lead to the skin's premature aging, visible in the form of sagging and wrinkles. "There's a highly complex cascade of biochemical reactions that occur as stress responses in the skin attempt to counteract UV-induced damage," said co-corresponding author Gitali Indra, associate professor of pharmaceutical sciences. "We need better ways to block UV exposure and also ways to lessen the damage by limiting detrimental physiological processes." Meadowfoam, named for the canopy of creamy-white flowers it produces when a crop is in full bloom, contains a class of compounds known as glucosinolates whose derivatives have been shown to have anti-cancer and sunlight-protectant properties. Indra and colleagues in the OSU College of Pharmacy looked at two derivatives from one such glucosinolate that's found readily in the "seedmeal" left over from meadowfoam oilseed processing; meadowfoam oil has industrial applications and also is used in shampoos and cosmetics. The scientists set up 3-D facsimiles of human skin reconstructed in culture plates, hit them with ultraviolet B radiation - the more harmful of the two types to reach the earth from the sun - and then treated the skin with the meadowfoam derivatives. and preventing hyperplasia - organ or tissue enlargement that's often an early stage in cancer development. "DNA damage is the precursor to photocarcinogenesis, and these derivatives reduce that damage, which means improved skin health and reduced cancer risk," said Arup Indra, associate professor of pharmaceutical sciences, affiliate investigator at OSU's Linus Pauling Institute and the other co-corresponding author. "The findings show a tremendous potential for utility in skin care products, besides just demonstrating the science on its own." The 3D skin reconstructions used in the study represent an important research tool, added Gitali Indra. "It's very important to not use animal models in the testing of cosmetics and skin care products," she said. "People don't like to see animal testing data, especially in Europe, where they'll put a picture of a bunny rabbit on a product so people know animals weren't used in the testing. This is a very good model that we can use to test many kinds of drugs by using different assays." The skin reconstructions are built from scratch, Arup Indra noted, meaning, for example, pigment-producing cells and immune cells can be added as a study requires. "We can look at how a compound slowly diffuses and see how it impacts collagen degradation and UV protection," he said. "It's really nice that we can tease apart these different functions." Because the glucosinolate derivatives inhibit the enzymes needed for the breakdown of collagen, they're effectively acting as anti-aging compounds. "Most cosmetics just sort of patch things up, cover up the damage, but this actually protects the skin," said co-author Fred Stevens, principal investigator at the Linus Pauling Institute and professor of medicinal chemistry in the College of Pharmacy. Findings were published in Frontiers in Pharmacology. Natural Plant Products, Inc., of Salem, Oregon, supported this research.